It's all based... on a lie. That Colin Kaepernick--who started the entire thing--was ignorant of history, was ignorant of the facts, and was largely ignorant of the icons he chose to put on t-shirts is irrelevant. That Roger Goodell--perhaps the most incompetent league commissioner in the modern era of sports--is incapable of thinking past the focus group worries of a non-flattering headline is irrelevant. That Mike Tomlin--who feigned righteous anger and declared he would not take a political side--even as he was choosing a political side and chastised an honorable former Army Ranger for what he should have done himself--is irrelevant. What is very relevant is that it was all based... on a lie. The national disgrace that was Sunday took place because a public, largely ignorant of facts, were spoon-fed emotional ultimatums by a media still seething with hatred towards a president whose win they've never accepted. That he so easily lit their fuse demonstrates their inability to think. That they blew it so out of proportion demonstrated their own lack of coherence with facts, and exposed an under-bellied desire to use lies to advance a narrative based purely on their hate for their president and the people who elected him. 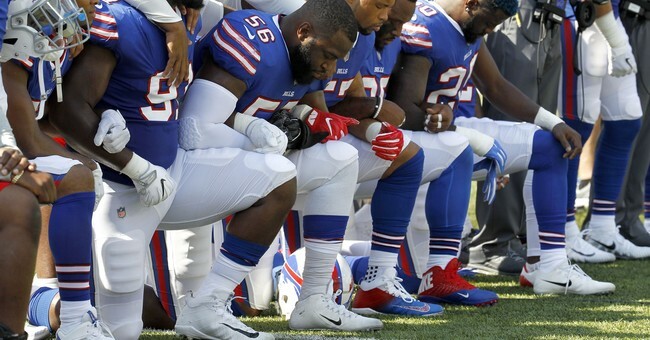 The players who took their knee on Sunday did so under the first dishonest idea that the president was attacking the players of the league in general. They believed and were repeatedly told on the networks that their First Amendment rights had been taken away. Then thanks to the coaching staffs of the Pittsburgh Steelers, the Seattle Seahawks, and the Tennessee Titans that were disobeying league rules found on page A62-A63 (which explicitly state: “The National Anthem must be played prior to every NFL game, and all players must be on the sideline for the National Anthem. During the National Anthem, players on the field and bench area should stand at attention, face the flag, hold helmets in their left hand, and refrain from talking. The home team should ensure that the American flag is in good condition. It should be pointed out to players and coaches that we continue to be judged by the public in this area of respect for the flag and our country. Failure to be on the field by the start of the National Anthem may result in discipline, such as fines, suspensions, and/or the forfeiture of draft choice(s) for violations of the above, including first offenses.” ) some teams believed they were remaining neutral when in reality, they did little more than boycott their own national anthem. The players that did this in the earliest game--played in London--did so on foreign soil, then stood and showed respect for the British National Anthem could be considered a direct act of disloyalty. But all of it was done out of emotion, anger, and rhetoric... that is based... on a lie. Kaepernick turned "radical" and began his "protest" following his intimate hook-up with an activist from Black Lives Matter. Said activist group now enjoys a 57 percent disapproval rating from the American people because they march and chant, "Cops are pigs!" Then they feel creative they describe putting "pigs in a blanket," and they aren't referring to the tasty treat your mom served in childhood using pastry and hot dogs. Black Lives Matter is also associated with the deaths of nearly a dozen police officers over the last two years and believes they have the right to be so because of police shootings. They justify this even as deaths of black men at the hands of rogue police officers are down in historical and numerical terms. But Black Lives Matter doesn't care about truth because as an organization, it too... is based on a lie. Black Lives Matter was largely organized in the aftermath of events that caused the phrase "Hands Up Don't Shoot” to become popular. This phrase was reported by the press (see the problem here), and it was commonly repeated that these words were spoken by Michael Brown in Ferguson, Missouri. The press repeated this narrative in literally thousands of recounts of the events of Ferguson. T-shirts were made, commercials of celebrity montages invaded our TV screens, and Black Lives Matter was born. In the 5000-plus pages of grand jury transcripts, no one--not a single person--not one eye-witness--was able to state truthfully that Michael Brown was shot while running away, that he had his hands up, nor that he ever spoke the words, "Hands up! Don't shoot!" When under oath and penalty of perjury, witnesses that had told television stations one thing, told investigators the complete opposite. He did not follow the officer's instructions. And he never said, "Hands up! Don't shoot!"